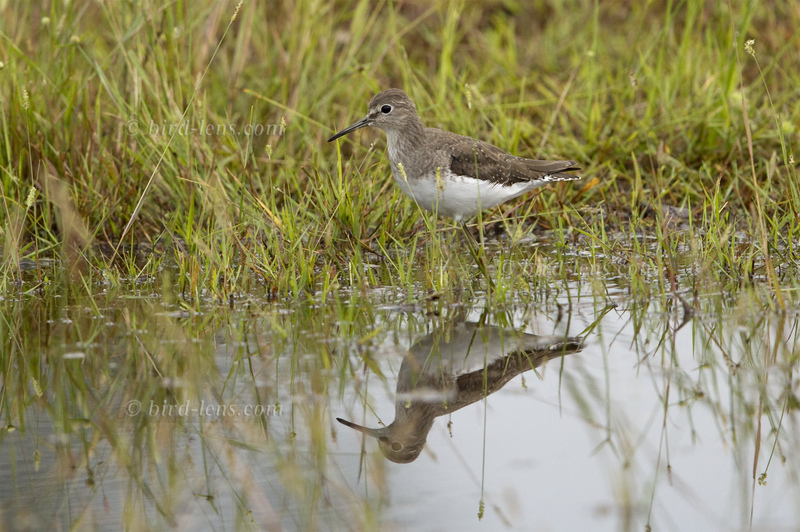 During scientific research in the northern Pantanal between the 20th of December 2012 and the 10th of January 2013 I often observe Solitary Sandpipers along the muddy ditches on a farm. Of the two subspecies of the solitary sandpiper recognized the subspecies present probably was Tringa solitaria solitaria which usually has a more well-defined streak between the eye and the bill which are clearly visible on the images shot. On the other hand Tringa solitaria cinnamomea typically lacks these streaks, being more finely spotted and speckled instead. First I saw the Solitary Sandpiper (Tringa solitaria) on the muddy fringes of small pools, where you could see them from wooden bridges crossing these waters. There were no more but 3 individuals which you could see at one time. In between 10 days the water level rose by about half a meter. After that you only saw Solitary Sandpipers on muddy pieces of grassland between leaves of grass. These patches were characterized by highly degraded grassland, where cattle used to feed on quite recently.